Orlando ranked a top coolest city in U.S.
From its award-winning main streets to its always-on downtown scene, Orlando’s ascension to “coolness” has been increasingly recognized by tourists, journalists and residents. Ranked the No. 19 coolest city in the country by Forbes, Orlando is earning more and more recognition for its abundant recreation activities, eclectic neighborhoods teeming with local businesses, and growing millennial population. One of Orlando’s most iconic districts, Mills 50, was named top 12 coolest neighborhoods in Thrillist. Known for its prolific street art and painted utility boxes, Mills 50 is a culturally diverse haven – and this diversity extends to its food scene. Mills 50 was the home of the original Hawker’s restaurant, an Asian tapas kitchen that now has four locations and is opening a combined headquarters and central kitchen downtown soon. Mills 50 is also home to locally owned Pig Floyd’s Urban Barbakoa, Tako Cheena, and a new-age winery, Quantum Leap. The City of Orlando has worked diligently to foster and supports is local neighborhoods through its Orlando Main Streets program. Orlando Main Streets creates, defines and strengthens existing neighborhoods by enhancing assets such as distinctive architecture, a pedestrian-friendly environment, personal service, local ownership and a sense of community. 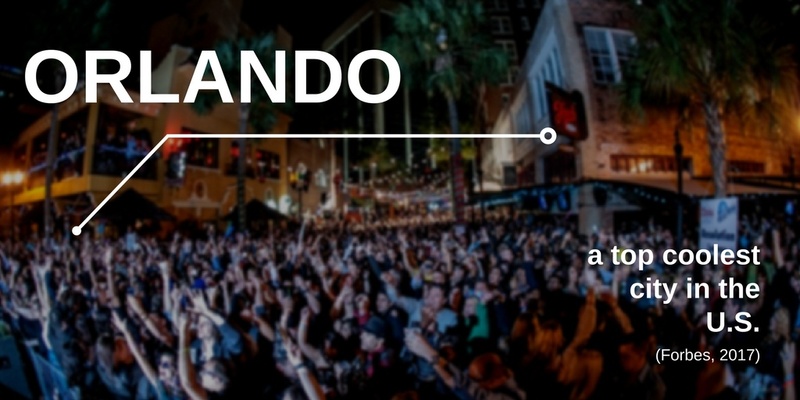 As a writer from the Evening Standard found, downtown Orlando’s lively nightlife includes a mix of world class dining, professional sports, live entertainment, night spots, theater as well as Orlando’s award winning Amway Center. On Saturday nights downtown, the entire main street is blocked off to allow for an active nightlife and club scene. And with recent developments including the Dr. Phillips Performing Arts Center and the Orlando City Soccer Stadium, all walking distance from downtown, residents and visitors alike can find no excuse for not spending a walkable night on the town. Even Winter Park, another small city bordering the Orlando city limits, is gaining recognition – Travel News ranked it the best small town to visit for Halloween. A walkable city famed for its cobblestone streets, upscale shops, tree-lined avenues and relaxed pace, Winter Park also boasts The Alfond Inn, one of the Top Hotels in the World in the Travel + Leisure World’s Best Awards 2017. Photo courtesy of Visit Orlando. The PR team at the Orlando Economic Partnership is your source for business news in Orlando, providing you with story ideas about trends, people and companies; statistical information and background; offering expert sources; and connecting you with community leaders.